We understand it can be difficult to plan and personalize your perfect wedding in Mauritius from a distance. A lot of people dream of getting married abroad in an exotic and beautiful location, but many don’t realize how easy it is to make it a reality. We talked with Sandrine from ‘Oui au Soleil’ (‘Yes in the Sun’) to ask her about her expertise in making Mauritius destination weddings both personalized and perfect. What was your inspiration for creating Oui au Soleil? Why Mauritius? Oui au Soleil actually began as a combination of 3 elements. Firstly, I’d always wanted to do something connected to the world of weddings. Secondly, after I’d become settled in France for a few years, I wanted to find an occupation that would take advantage of my professional skills. My experience is based in the world of communication and public relations. And thirdly, as a diplomat’s wife (at the time of Oui au Soleil’s launch), I also wanted to promote my beautiful country in my own unique way. Have you got your own Mauritian love story? 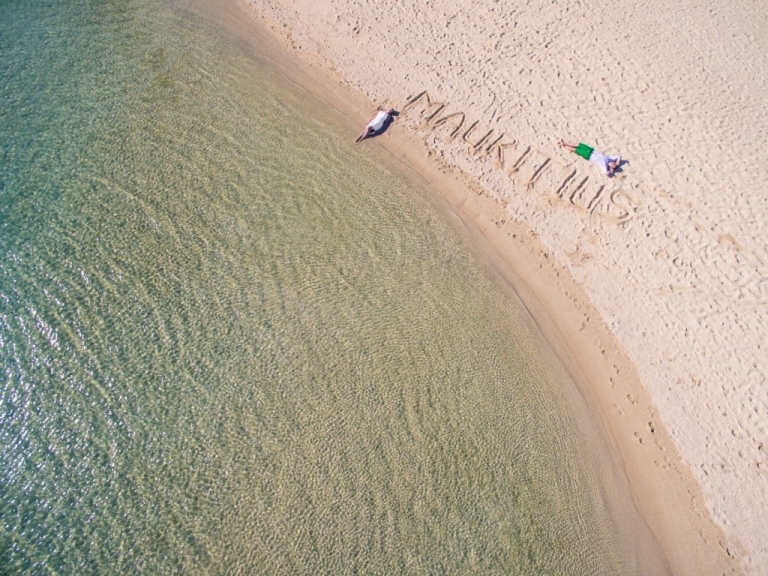 We can indeed say that I’ve known a “Mauritius love story” in more than one way. My husband is Mauritian and I also fell in love with the island of Mauritius, where my 2 children were born. It was our home for 10 years. Oui au Soleil is an informative blog that gives advice, lists local wedding professionals and has testimonials of happy couples who have said “I do” on the Mauritian beaches. It’s ideal for anyone thinking of getting married in Mauritius. In fact, this destination makes the dream come true to several thousand couples every year. Couples used to have difficulties finding all of the useful and necessary information on just one platform. Until now. The platform is also helpful for Mauritian couples who are looking for a place to celebrate, a photographer, a florist or even decoration ideas for their wedding. Oui au Soleil fills this void and makes it possible to highlight many wedding professionals, perhaps ones that aren’t heavily advertised but are just as qualified – if not more so. What can couples expect when they come to your website? Oui au Soleil gives them practical advice, authentic recommendations and wedding inspiration. Thanks to my “Address Book” section, my readers get to choose from local and French professionals according to their profiles. That helps them make more informed decisions and they feel supported in the organization of their big day, especially so far from home. Through the “Testimonials” section, they can already picture their own marriage, while finding recommendations for the providers these couples put their trust in. We noticed you have 2 interesting sections. One is “Mauritius News” and the other is “Inspiration.” Can you tell us more about them? The first (“Mauritius News”) allows me to put more emphasis on the ‘tourist’ current events of the island. For example, a hotel that has reopened after renovation, another place who has won a prize for excellence, the Tourist Office that participates in an international fair, etc. The “Inspiration” section allows me to share decor ideas, invitation styles, gifts for guests (always related to an exotic wedding), or wedding-friendly accessories for the tropics. There are also ideas on how and where to have sumptuous photos that really showcase the beauty of the Mauritian landscape. Have you seen any recent destination wedding trends you adore? The trend of aerial photos, precisely. Experiencing a wedding destination is an incredible opportunity. Couples are obviously more and more interested in aerial photos taken by drone. To be able to make the most of the beauty of the places and the breathtaking settings that Mauritius offers them for their wedding photos is priceless. What do you enjoy most about newcomers to Oui au Soleil? The main purpose of Oui au Soleil is to help couples that are looking for information and ideas for their marriage in Mauritius. That’s why I’m particularly happy when readers write me directly for advice. But another objective, for me, is also achieved when I’m complimented on the quality, the beauty and the vibrancy of the website. I’m deeply committed to the quality, plus I want my blog to allow people to dream about a perfect wedding. I think it’s doing pretty well. Why do you think destination weddings have become so popular in Mauritius? With its many luxury hotels, and the excellent tourist reputation it’s always enjoyed, it was natural for Mauritius to become one of the most popular wedding destinations abroad. But beyond its postcard landscapes, its hotels with sophisticated infrastructures and its experienced professionals, I think that what makes Mauritius’ success as a wedding destination today is the quality of the services we offer. There is the genuine friendliness and the “caring” side of Mauritians with their clients. The kindness and the happiness of its people are naturally imprinted in their DNA. I think this is definitely our added value. Have you got any plans for the future of Oui au Soleil ? Can you be contacted directly or is there a social media platform you use the most for updates? I always gladly answer any questions my readers have – just ask! Franco-Mauritian, Sandrine runs the first blog that’s entirely dedicated to weddings in Mauritius. Through ‘Oui au Soleil (http://ouiausoleil.fr),’ she gives advice, recommends and helps guide couples for their dream wedding under the sun. For more ideas and an excellent listing of professionals for your stay in Mauritius, follow her social networks: @ouiausoleil (Facebook, Instagram, Pinterest and Twitter). That’s it for our interview with Sandrine about how her platform can help personalizing your perfect wedding in Mauritius. What about you? Have you got married in Mauritius? How did you plan it? Are you planning a wedding there in the future? How will you organize it? We’d love to know your thoughts, let us know in the comments below!